alaTest has collected and analyzed 14 reviews of Samsung SC-D590. The average rating for this product is 4.5/5, compared to an average rating of 4.0/5 for other Camcorders for all reviews. Reviewers really like the price and portability, whereas many are critical about the color and reliability. Comments are divided on the size. We analyzed user and expert ratings, product age and more factors. Compared to other Camcorders the Samsung SC-D590 is awarded an overall alaScore™ of 75/100 = Good quality. alaTest has collected and analyzed 11 user reviews of Samsung SC-D590 from Amazon.com. The average user rating for this product is 4.5/5, compared to an average user rating of 3.9/5 for other Camcorders on Amazon.com. Reviewers really like the price. The portability is also mentioned favorably. Some have doubts about the color and reliability. 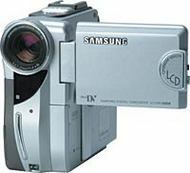 Samsung SCD590 MiniDV Upright Digital Camcorder with 2.5" LCD Display, 12X Optical & 8MB Memory Stick. Samsung SCD-590- most bang for the buck! Samsung's range of advanced digital camcorders makes near-broadcast quality footage attainable for the whole family; while for advanced users there's the additional possibility of connection to a PC for professional style editing. Samsung's digital camcorders are more compact than analogue models and thus are a great companion for taking on holiday or on day trips. Features include electronic image stabilization, 400: 1 variable speed digital power zoom, nite pix, 9 digital special effects, tape speed, built-in digital still camera, 8 step manual shutter, 210k pixel trans-reflective optimum vision LCD, EZ dial navigator, smart shoe for external accessories, and external microphone.